The last step of the data visualization process: what are you trying to find in your data? You may remember my first two posts in this series about classifying data attributes and encoding the values in graphic charts. My goal in putting this blog series together is to offer readers an easy guide for how to properly map data. This is only the beginning of the conversation. When it comes to data visualization, there are many areas that I haven’t covered yet (but hope to soon!) Hopefully this has been informative and it allows you to focus more on the insights you can draw from your data as opposed to spending extra time mulling over which chart is the right chart. Our third pillar of mapping data to visualizations has to do with usage. More accurately: it’s a question of what you want to see in your data. Without knowing what your data set looks like I would suggest using a bar chart as opposed to a line chart (unless you’re looking at trends over time). I would also say that it’s rarely a good idea to use a pie chart – but there is more to it than just a set of guidelines without referencing the data. 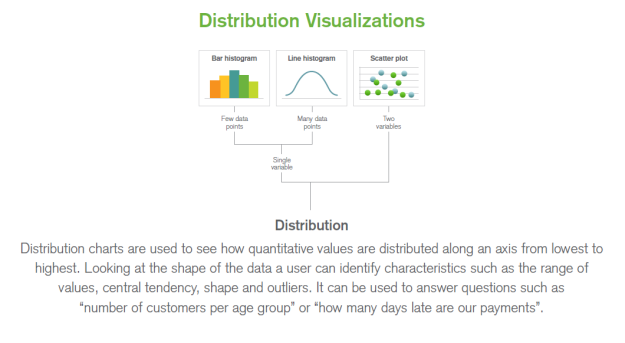 Each time you map data to a visualization, the key thing you need to consider is: What are you trying to show the user? It isn’t a question of what looks pretty, anyone can do that: you want a chart that demonstrates value and achieves its purpose in an easily recognizable way. 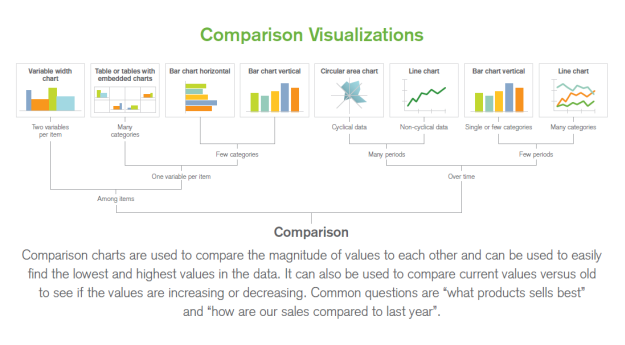 Comparison – These visualizations relate to the time and size of your data. You are basically comparing multiple values: in some cases the data is timed and in others it’s itemized as you can see above. Unfortunately there isn’t one chart you can use for all-timed data; some situations dictate line charts while others merit bar charts or area charts (for cyclical data). For fewer categories among items, a bar chart’s length displays the differences in your data better than its angle. That’s the reason why we prefer a bar chart to a pie chart when it comes to comparison. If you remember my blog post about encoding data you can see that length is more accurate than angle on interval/ratio data. 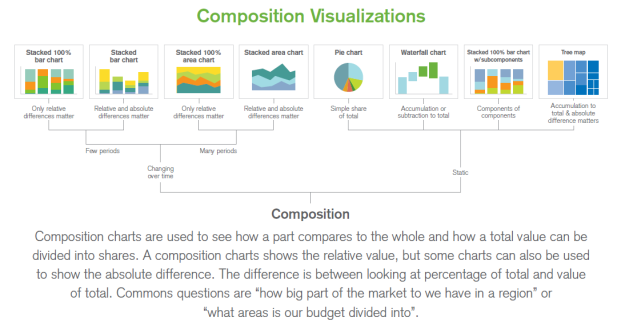 Composition – These visualizations refer to data sets that change over time or include static data (do not occur over time or are non-spacial). With static data, a pie chart can work, however there are a host of other options that can tell the same story. With data that changes over time: the number of data points is a critical asset. One should also consider that the axis needs to match the order of the data (ergo in a stacked bar chart the years 1990-1999 should be listed in order as opposed to by highest value). Distribution – Here you are mapping a single variable versus two variables. With this data set, you don’t want to scroll bars to toggle through the data: you just want the full picture. As you can see from the choices above if you have many data points, it’s best to use a line histogram. If you are interested in mapping every point, you would want to use a bar histogram. 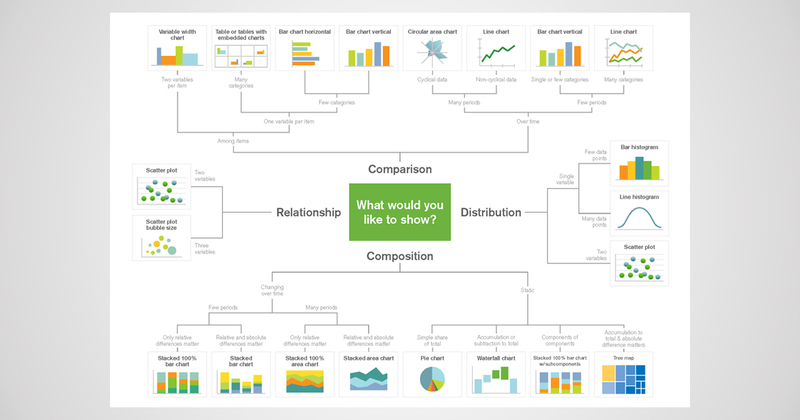 Relationship – The fourth and final group of visualizations ups the ante from the Distribution charts. Here you are always mapping two or three variables. The best guideline to follow in this case is rather clear cut: if you have two variables and you want to add nominal or ordinal data to categorize your data, then use color. But if you’re adding a third variable that’s interval or ratio you can see that size is better. This also ties back to my second blog post about the best way to encode data. I hope that the process of experimenting with data visualization is now clearer to you. Hopefully you can begin to consider other factors in your charts, including the things we didn’t cover, like maps, slope graphs or box charts. Through this series, I wanted to point out that there are more ways to visualize data than a simple bar chart or pie chart: it’s more about properly representing your data and how you display it to your users.